the book doesn't include the extra sizes with more details. They wouldn't fit in the book! This is a Digital download only, not a physical copy. Requires the Phillips Fiber Art Ten Degree Tool. 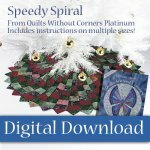 Pattern, originally from the book Quilts Without Corners Platinum comes the Speedy Spiral in digital pattern for the first time! Digital download patterns are not for resale! Please do not reproduce for any reason!